Is Oily Econo-Politics Behind Saudis’ Crude Canadian Diplomacy? For such an ugly and bizarre international fistfight to spring full-blown from a single critical tweet strains credulity. Underlying the Saudis hostile anti-Canadian actions may be a desire to signal the world to stay blind to the kingdom’s internal repressions. Or it may be an economic play with Canadian oil. In a near repeat of Saudi Arabia’s feud with Qatar last year, the diplomatic spat between the Saudis and the Canadian government seems to have spiralled out of control after it began last Friday. Apparently beginning as a result of the Canadian Foreign Ministry’s decision to criticize via Twitter the Saudi government’s arrest of the sister of detained Saudi activist Raif Badawi, the days since have seen the Saudis expel the Canadian ambassador, suspend flights to Canada, recall around 15,000 Saudi students studying abroad, and freeze new trade and investment in Canada, among other measures. The most disturbing exchange between the two countries took place on Monday when a Saudi state-sponsored Twitter account tweeted a graphic appearing to show an Air Canada airliner heading toward the Toronto skyline in a way similar to the September 11th attacks, in a gesture that seemed to imply that the Saudis would target Canada for its “interference” in the kingdom’s internal affairs. Then, early Wednesday, Saudi resolve to punish Canada for its criticism of the kingdom’s treatment of domestic dissenters and activists was again made clear after the Saudi central bank and state-managed pension funds ordered their foreign-based asset managers to liquidate their Canadian equities, bonds and cash holdings “no matter the cost.” Those funds were estimated by the Financial Times at around $100 billion. If Riyadh’s on-going squabble with Qatar is any indication, the Saudis are likely to continue to flexing their political and economic muscle in an effort to push the Canadian government to capitulate, even if it results in the Saudis pushing truly bizarre countermeasures. Yet, while the Saudis themselves and much of the media coverage have painted the increasingly bizarre stand-off as a result of “human rights” concerns, it is unlikely that Saudi Arabia’s offense at a single tweet from the Canadian Foreign Ministry is to blame for the rapid decay in bilateral relations. Indeed, some have speculated that the fierce response from the Saudis is intended to serve as a warning to any other government that would seek to criticize Saudi policy, particularly those policies ordered by the kingdom’s “reformer,” Crown Prince Muhammad bin Salman (MBS). If this is the case, the high price Canada is paying for a single tweet critical of the Saudi government is a clear sign to other nations that the Saudi government will not tolerate dissent in any form, whether from its own people or from other nations. Is oil lurking under the Saudis’ thin skin? Another possible reason for the spat, however, is that the tweet from Canada’s Foreign Ministry offered MBS an opening to go after its top competitor in the U.S. oil market — one of the most important oil markets, given that the U.S. is the second largest importer of crude oil in the world and the U.S. military is the largest consumer of oil in the entire world. Despite forging close ties with the Trump administration and their historical cooperation with the U.S. through the petrodollar system, the Saudis were displaced by the Canadians starting in the late 1990s as the top exporter of crude oil to the United States. Since then, the gulf has widened largely thanks to the fast growth of Canadian oil imports — which now account for more than half of all U.S. crude imports, while U.S. imports of Saudi crude have dropped to 8.5 percent of the total. This may explain why the Saudis have targeted the Canadian economy in particular as the current diplomatic crisis has worsened. Indeed, rejections of Canadian wheat exports by the Saudis is expected to cost the Canadian of region of Alberta alone over $132 million a year, weakening Alberta’s already struggling agricultural sector. Canada’s total exports to Saudi Arabia, now under threat, total on average $1.45 billion annually. Even the Saudi decision to remove 15,000 Saudi students from Canadian universities is expected to remove around $2 billion in investment from the Canadian economy. Furthermore, restrictions on future investment and the removal of some $100 billion in Saudi money from Canada — in addition to impacting Canada’s economy directly — may also spook investors from Saudi-allied countries, particularly considering how Saudi has handled its dispute with Qatar. This may be a large concern giving the number of Middle Eastern and North African countries that have backed the Saudis in their current spat with Canada. Thus, the already in-place measures the Saudis have levied against Canada are likely to destabilize the Canadian economy to some extent though the Saudi’s recent promises that more is to come may increase that effect in the days and weeks ahead. Another consequence of the rift could target Canadian oil exports directly. If Canada responds to the rift with the Saudis by halting the relatively small amount of Saudi oil it currently imports, Canadian oil will be used to meet that demand. While such a move is of no great consequence for Canada, it would mean that an estimated 31 million barrels of crude would be used domestically and not exported to the United States or elsewhere on an annual basis, conveniently offering the Saudis an opportunity to replace that deficit by exporting more to the United States. However, 31 million barrels of crude oil is not very significant in terms of Canada’s and the Saudi’s total oil exports. The more likely reason for a Saudi effort to hamper the Canadian economy and its oil exports has to do with the larger reshuffle in the oil economy resulting from the U.S. government’s efforts to stop Iranian oil exports. Indeed, as the U.S. government’s main plan to offset the void that would be left by an end to international purchases of Iranian oil has been its push to force the Saudis to dramatically increase oil production to a record 11 million barrels a day in order to meet the existing demand. Yet not all has gone as planned. First, some countries, like Turkey, announced that they would continue to import Iranian crude despite the threat of U.S. sanctions. Complicating matters further is the prospect that the U.S. would “soften” its demand that countries halt Iranian oil imports by the November 4th deadline. Then, the most troubling news of all, from the Saudi perspective, came last Friday when the world’s largest oil importer, China, announced that it plans to continue importing Iranian oil, a major boon to Iran given that China accounts for 35 percent of Iranian oil purchases. Furthermore, China announced earlier this year in May that it would be severely reducing Saudi oil imports. With the gap caused by reduced Iranian oil exports to fill likely smaller than it had thought, the Saudis need buyers for their increased oil production and, if all else fails, it is likely that they will expect the default buyer to be the United States, given that Washington pushed for the production increase in the first place. Yet, with U.S. oil purchases from Canada at an all-time high, there isn’t much room for an increase in the Saudi market-share — that is, unless Canadian oil currently being exported were to be redirected for domestic Canadian use, thus offering less of a challenge to Saudi oil exports. Perhaps then it is no coincidence then that the Chinese announcement preceded the Saudi-Canadian spat by a matter of hours. If this is the case, it certainly wouldn’t be the first time that Saudi diplomatic attacks have been motivated by fossil-fuel markets. In fact, the Saudis’ ongoing dispute with Qatar was ultimately caused by Qatar’s lifting of a moratorium on developing the world’s largest natural gas field it shares with Iran and its related normalization of diplomatic ties with Iran’s government in light of their shared interests in the gas field. Furthermore, Saudi Arabia has a history of using unconventional means to damage the economies of its oil rivals — though this has normally occurred through the Saudis’ manipulation of oil prices, enabled by their privileged position as a top oil producer. Past efforts to this effect have been successful in several cases, such as when the Saudi-led price war against Russia in the 1990s led Russia to default on its debt in 1998 and thus neutralized what the Saudis had perceived as a major threat to its oil supremacy at the time. The Saudis, with prompting from the U.S., attempted a similar scheme to squeeze out higher-cost and smaller producers beginning in 2014, and largely succeeded in weakening smaller countries with oil-dependent economies, such as Venezuela and Ecuador. With the oil market now facing several unknowns — from the effect of looming U.S.-backed Iran sanctions to the U.S.-China trade war — Saudi Arabia is likely looking for a way to maintain its market supremacy. While Canada may have offended Saudi leaders with a recent tweet, it seems very possible that the Saudis saw the tweet as an opening to justify economic attacks of increasing severity against a major oil-market rival. Now, with Saudi foreign cash reserves still very low, reforms aimed at diversifying its economy moving at a snail’s pace, and warnings that the kingdom could face bankruptcy in less than two years, even small fluctuations in the oil market — along with growing domestic dissent — threaten to derail the kingdom or loosen the grip of the ruling family. 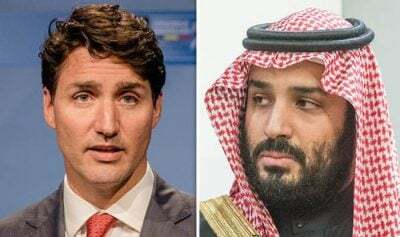 It is most likely that Canada has reminded the Saudis of both of their weaknesses — economic and political — at a time when the Kingdom finds itself faces an uncomfortable and perhaps unforgiving future.